SO pink! SO translucent! SO gem grade! 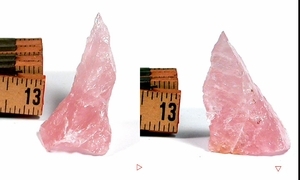 This miniature size South Dakota rose quartz rough is JUST so happy! Wirewrap it, stand it by you, laugh with it! 3/4x 1x 1-7/8" tall, sharp edges and 'point'. Chosen by hand from TONS, as all of our crystals are.